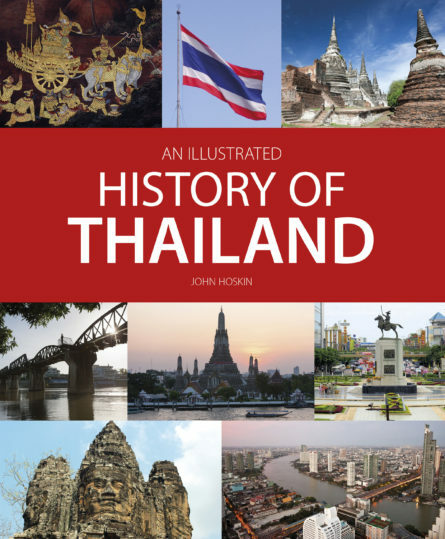 This fully illustrated history is divided geographically according to the sequence of succeeding Thai kingdoms. Each section follows a historical chronology, covering accounts of major events during each reign, with an assessment of the character of individual kings and their particular achievements, together with those of other major players. This record of events is blended with descriptive passages about monuments surviving today that are relevant to and help illuminate the history. Political development is thus paralleled by Thailand’s cultural development, especially in relation to the religious and royal architecture. Thailand’s historical progression has been complex, and although the foundations of national identity – religion and monarchy in particular – were established in the earliest days of statehood dating back to the 13th century, it is only in comparatively recent times that all elements – social, political, cultural and linguistic –have cohered into what is recognizable today as Thai and Thailand. By linking the text to existing landmarks the history provides both an enjoyable read in its own right and a fascinating guide to the monuments and buildings that visitors can see on their travels around the country. John Hoskin is a British writer who has been based in Bangkok for the past 32 years. After completing a BA degree in History and a Masters in Cultural Studies at the University of Birmingham, England, he worked in London, Sydney, Amsterdam and Hong Kong before settling in Thailand. He is the author of more than 20 books on Thai and Southeast Asian history, culture and travel, including The Mekong: A River and Its People, Bangkok by Design, Presenting Thailand and The Thai World.